ISLAMABAD: Renewed efforts for finding a path towards lasting peace and security inside Afghanistan was the main topic of discussion between Foreign Minister Shah Mahmood Qureshi and Afghan President's Special Envoy on Afghan Reconciliation Omer Daudzai at the Foreign Office on Tuesday. 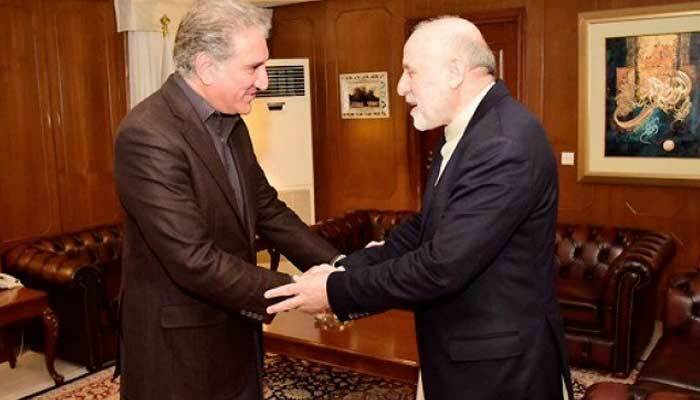 With a change in dynamics of the Afghan issue, Pakistan is in the forefront and Islamabad is the first capital that Daudzai has chosen to visit after he took over his new office. Kabul hopes that Pakistan can push the Afghan Taliban to agree to start talks with the government of Ashraf Ghani. So far, the Taliban call the shots and have refused any such meeting. “Pakistan will continue to play its vigorous role for bringing lasting peace in Afghanistan. Peace and stability in Afghanistan is in Pakistan’s own best national interest, and necessary for economic development and prosperity in the region,” Qureshi was quoted by his office as telling the Afghan dignitary. He told the Afghan dignitary that there was a growing international convergence on the need to end the suffering of the people of Afghanistan through peaceful settlement of conflict. Qureshi recently visited several regional countries with Afghanistan on top of his agenda, where there was an agreement that a political solution was the only answer to the conflict inside Afghanistan. In this regard, Pakistan says it will do all to help the people of Afghanistan and see the earliest possible end to bloodshed to enter a new phase of peace and prosperity. As Daudzai flew into Pakistan, the Afghan Taliban have cancelled peace talks with officials from the United States in Qatar which were to start today (Wednesday) following disagreements over the agenda of the meeting, the group confirmed on Tuesday. As the US tried to rope in representatives of the Kabul government, the Taliban rejected the participation of the Afghan government officials in the deliberations. Daudzai conveyed the deep appreciation of the sincerity and vision of Prime Minister Imran Khan for peace and stability in Afghanistan. “The foreign minister’s visits to Kabul within on bringing the Western-backed Afghan government to the table. The talks will be the fourth in a series between Taliban leaders and US special envoy, Zalmay Khalilzad. "After mutual consultations, we are going to meet US officials in Doha on Wednesday. The meeting will continue for two days - Wednesday and Thursday," said a senior member of the Afghan Taliban on condition of anonymity. Pakistani and Iranian officials said they were trying to persuade the Taliban to meet Afghan officials. Another senior Taliban leader confirmed the Qatar meeting and said no other country would be involved. At the request of the US, a Taliban office was established in Doha in 2013 to facilitate peace talks. But the office had to be closed after the Taliban came under pressure for hoisting the same flag at their office that the group used during its rule in Afghanistan. Subsequently, the then Afghan President Hamid Karzai halted all peace efforts, saying the Doha office was presenting itself as an unofficial embassy for a government-in-exile. The flag has since been taken down and the office has remained empty with no official announcements of a possible reopening. Talks with the Taliban have since been taking place elsewhere in Doha.